Need To Move Large Items But Have Difficult Access? Stairs Too Tight or Lift Too Small? 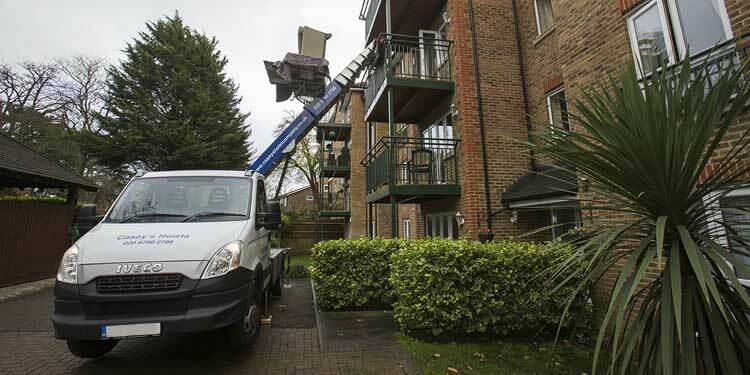 Apart from the services usually associated with a house move we also provide, either in conjunction with other services or as a standalone service, a furniture platform hoist rental service. Given that homes have become much smaller having narrower doorways or many more of us reside in high rise apartments or flats it becomes increasing tough in order to get that nice new sofa/American Fridge Freezer/display unit etc through the door or up the stairs. Our Furniture Hoist can certainly overcome these problems in a speedy and reliable manner. It will take a max weight of 400kg in just one lift together with reach of up to 24m. We not only make use of it for local house and flat moves but in a wide range of business organisations which include Landscape Gardening (on roof terraces), Building, Blind Fitters, Piano removals and various others. We can also offer related services for instance, added labour and also window removing. The furniture hoist service includes a fully trained operator and comes with LOLER certification so as to ensure safe operation. Do You Need To Rent a Furniture Hoist or Platform? No matter how hard you are trying to squeeze that 4 seater couch or super King size bed up the stairs or through that narrow doorway, taking delivery of that wonderful modern Range Cooker or struggling to remove that unwanted piano, it simply will not go in or out. The most reliable solution is use rent our furniture platform hoist, which in turn will definitely save on time, money plus effort. Phone our team right away on 020 8780 2348 for a quote or even to find out more.